1. All items are sold as is, where is, with all faults. There are no warranties or representations of merchantability, of fitness, nor of any other kind, express or implied. All items are available for your examination prior to bidding. Your bidding will signify that you have examined the items as fully as you desire to or that you have chosen not to examine them. Written and oral descriptions are our opinions and should in no way be construed as a guarantee of any kind as to age, condition, materials or any other feature of items being sold. Our goal is to provide prospective bidders with accurate and detailed information. We recommend prospective bidders examine all items in which they have an interest. If you require absolute certainty in all areas of authenticity, and the results of your evaluation leave uncertainty in your mind, we recommend you not bid on the item in question. We do not give refunds. All sales are final. No statement written or oral made by the auctioneer shall be deemed a warranty or assumption of liability by Marion Antique Auctions and Turkey Creek Auctions or by any seller represented by Marion Antique Auctions and Turkey Creek Auctions. We have made every effort to provide provenance for the autographed items in this auction however cannot guarantee any of the autographs to be authentic. This collector whose estate we are liquidating purchased things from reliable sources and in many cases obtained the signatures directly from sports figures and celebrities. We have included numerous photos of Leland Campbell, the collector, at signing events.2. Once we declare that an item is sold, we cannot reopen the bidding. It is the bidder's responsibility to get our attention prior to our saying sold. If we are missing your bid, please get our attention before we say "sold". We reserve the right to reject any bids deemed inappropriate. If an item is withdrawn from the auction it will be offered again only at the auctioneer's discretion.3. Payment must be made by cash, approved check, MasterCard, Visa, Discover, American Express or wire transfer within 15 days. If items are not paid for with 15 days, the sale may be cancelled. We reserve the right to require certified bank checks for large purchases. Marion Antique Shop reserves the right to withhold merchandise paid for by check until the check clears our bank. We do not accept checks or credit cards from other countries. Payment must be made by wire transfers.4. We do not offer credit. Payment for all purchases is expected at time of purchase.5. We are pleased to offer absentee bidding for prospective bidders who cannot be present at the auction. Absentee bids left with us are executed competitively and confidentially. In the case of identical bids left with us, the bid received first will prevail. Absentee bids or bids left online are not executed until the item goes up in the live auction and the order in which they are received is not a factor.6. Purchaser agrees that packing and shipping shall be at the purchaser's expense and payment for same will be made directly to the shipper. We do not provide in-house shipping but we are pleased to offer the telephone numbers for local packing and shipping companies. Please allow two weeks from receipt of payment for shipping. Turkey Creek Auctions shall have no liability for any loss or damage to shipped items. 7. Unless exempted by law, all purchases are subject to 7% Florida sales tax(6% State 1% County). Sales tax numbers from other states are accepted, but the resale tax form must be fully and completely filled out and received prior to time of purchase.8. 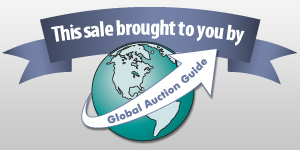 Bidding on an item indicates your understanding and acceptance of these Terms of Sale. If a purchaser breaches any of these Terms of Sale, including the obligation to pay for purchased items, Marion Antique Auctions and Turkey Creek Auctions may seek all remedies under the law including canceling the sale and re-offering the property without reserve.9. A buyer's premium of 20% will be applied to the purchase price of all items. 25% for LiveAuctioneers. 25% for Invaluable.10. Marion Antique Shop and Turkey Creek Auctions reserve the right to charge a storage fee of $5.00 per day, per item for purchased items not picked up from our auction facility within ten business days of the auction.11. All radios & Televisions are sold "as is" with no guarantee that they are in working condition.12. Bidders outside of the U.S. must inquire about shipping before they register.13. Bidders from outside the U.S. must provide a valid credit card to register.14. All dimensions and weights given are considered approximate.15. Purchases must be paid within 15 days or they become subject to cancellation. Disputes with applicable bidding service will be filed in the event of nonpayment.16. Gold, coins and jewelry- shipping is subject to a 2 (two) week waiting period for credit card or check payments received from bidders without substantial bidding history. Gold, coins and jewelry will be shipped only to the address matching the credit card used for payment. Feel free to bid even if you do not have an established bidding history, just be aware that shipping will require payment verification. LOT OF 2 RED SOX RAWLINGS TEAM SIGNED BASEBALLS. BINDER CONTAINING 14 PIECES OF BASEBALL EPHEMERA. 2 HALL OF FAME JERSEYS . ONE IS MITCHELL & NESS. LOT OF 6 HALL OF FAME SIGNED RAWLINGS BASEBALLS. LOT OF 12 RAWLINGS HALL OF FAME SIGNED BASEBALLS. LOT OF 12 SIGNED RAWLINGS HALL OF FAME BASEBALLS. LOT OF 6 HALL OF FAME SIGNED BASEBALLS. LOT OF 9 BASEBALLS SIGNED BY 7 HALL OF FAMERS.